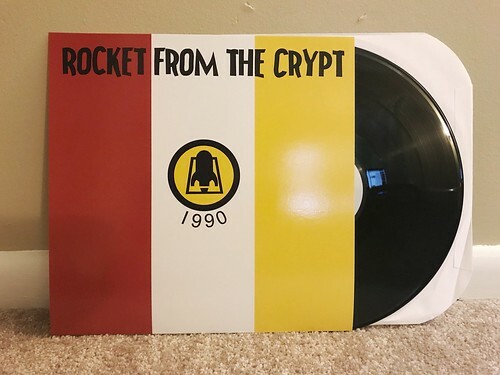 I Buy Way Too Many Records Dot Com: Rocket From The Crypt - Bootleg 12"
This bootleg, one sided 12" has been kicking around for a few years, occasionally popping up on Discogs or eBay at a ridiculous price. I'm not sure where they came from or why someone would be bootlegging anyone, let along Rocket From The Crypt, these days. But in an effort to keep the collection complete I did pick up a copy when I found one that dropped to a semi reasonable price. The songs on here haven't ever been released on vinyl before, so that's a plus. The record starts out with the song "My Silverhead." This is one of those Rocket tracks with a mysterious pass. For the longest time, the rumor was that this song was preloaded on some wacky MP3 player that was sold in the burgeoning days of that technology. I have no proof that this is the case, but the song has been circulating on the dark web ever since. The version on this 12" sounds way better than the MP3 that I have, so I'm pretty pleased that this is on here. The 12" finishes up with two live cover songs. These seem to be taken from an in store performance. When Group Sounds came out, Rocket played a few afternoon in stores before their real show later that evening. They were loose and low key and the one I went to at Tower Records in NYC was a blast. The two songs here are covers of "Down In The Boondocks" and "Blue Cowboy." Both are fun and the sound quality is pretty good all things considered. While I would prefer an official vinyl release for all of these songs, this 12" is still a decent little addition to the Rocket collection. They made a few odd choices with track selection and the track list on the sleeve itself is totally wrong ("Lambs For Sale" anyone? ), but the sound quality of the vinyl is pretty good and the songs are, of course, pretty damn great.